– On 30 October a coalition of 22 leading European organisations released a report on the EU’s economic relationship with Israeli settlements –Trading Away Peace: How Europe helps to sustain illegal Israeli settlements. The foreword to the report was written by Hans van den Broek, the former Minister of Foreign Affairs of the Netherlands (1982-1993) and former EU Commissioner for External Relations (1993-1999). The report focuses on highlighting the disparity between what the EU says in regards to the settlements, and what it actually does in practice. Each year, the EU imports approximately EUR 230m (US$300m) worth of goods from the settlements, or 15 times the value of EU imports from Palestinians. Or to put it another way, the EU imports over 100 times more per settler than per Palestinian. The most common import from the settlements is agricultural produce, such as citrus and dates. 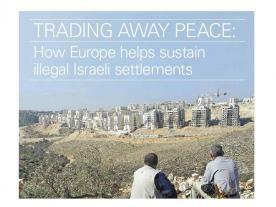 Further, a number of European companies have invested in the settlements and provide them with services. The report specifically names: G4S (UK/Denmark); Alstom (France); Veolia (France); and Heidelberg Cement (Germany). The report continues: "[A]dding to the contradictions at the heart of EU policy towards Israel’s illegal settlements, the EU has failed to fully exclude settlements from the benefits of its cooperation programmes and bilateral agreements with Israel.” The report also refers to the newly ratified EU-Israel Agreement on Conformity Assessment and Acceptance of Industrial Products (ACAA), as another example of the EU’s failure to adequately distinguish between Israel proper and the illegal settlements. The report further notes that: “[T]hrough the establishment of settlements, successive Israeli governments have created a discriminatory two-tier system in the West Bank with settlers enjoying all the rights and benefits of Israeli citizenship, and Palestinians subject to Israeli military laws that deprive them of their fundamental rights. The discriminatory legal systems applied by Israel in the West Bank has overseen the incarceration of over 730,000 Palestinian men, women and children since 1967 and was the subject of a recent joint submissionby DCI and WCLAC to the UN. The submission noted that the settlements, and their associated infrastructure, act as friction points where numerous human rights violations occur, involving men, women and children. • Ensure correct consumer labelling. As a more comprehensive option, ban imports of settlement products, as called for by Ireland. • Exclude settlement products and companies from public procurement tenders. This would include European companies associated with the settlements, such as G4S. • Remove organisations funding settlements from tax deduction systems, as done in Norway. • Draw up a list of companies misstating the origin of settlement goods as “Israel” as requested by the European Parliament.